A new initiative, Give A Minute, aims at nothing less than reinventing civic engagement for the 21st century. If anybody needs a feel-good moment in this winter of our discontent, it’s Michael Bloomberg. When the embattled New York city mayor gave his State of the City address yesterday he hoped to take the spotlight off the issues that have recently bedeviled both city residents and City Hall: snow removal screw-ups, fraud in the payroll system, withering criticism over a new schools chancellor, and fury over neglect of the boroughs. So, beyond addressing plans to build new infrastructure on the waterfront, reform the pension system, and allow livery cabs to pick up passengers in Queens and Brooklyn, the mayor announced a new program called “Give a Minute”, which is conceived as a sort of 311 for new ideas. 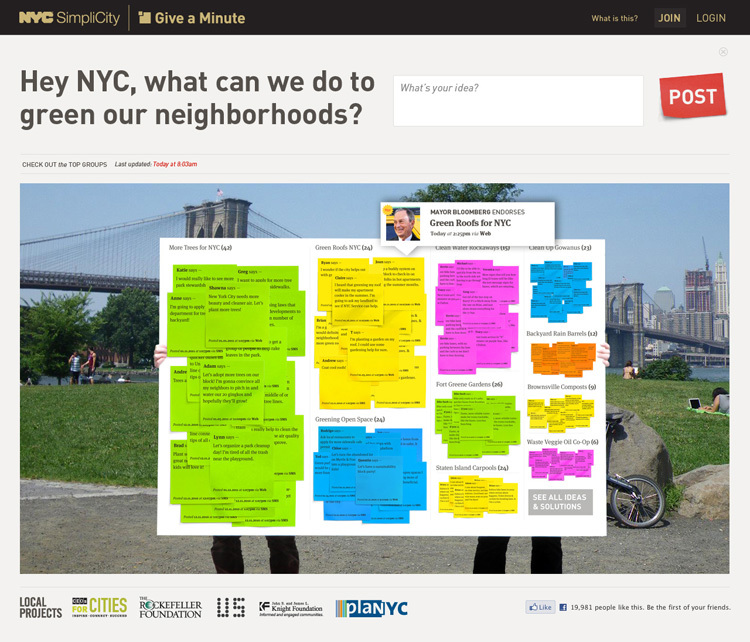 Created by New York media design shop Local Projects and urban think tank CEOs for Cities, and funded by the Rockefeller and Knight Foundations, the program, which will officially launch in late April or early May, will use crowd-sourcing to generate ideas for ways to make the city better, curated around a specific theme. 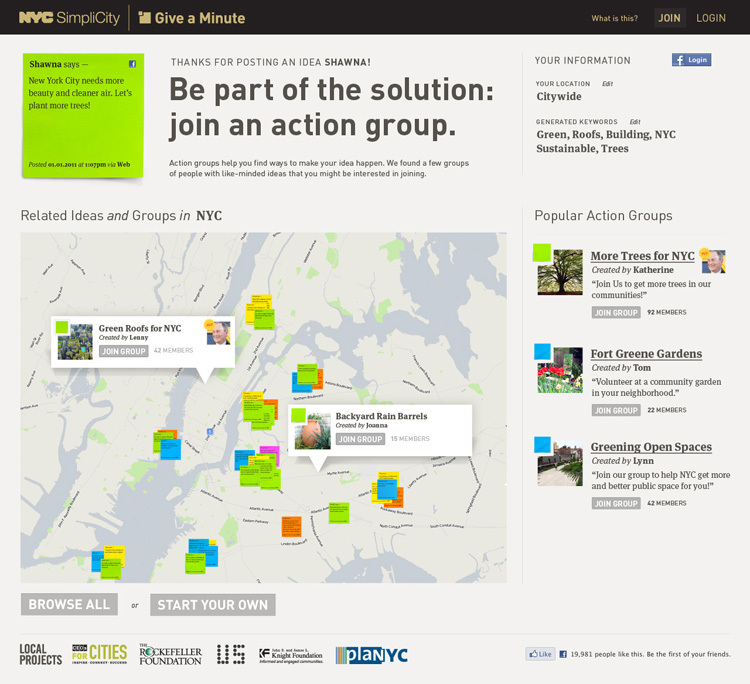 As part of a larger sustainability-focused initiative, PlaNYC2030, “Give a Minute” New York, will ask citizens to contribute ideas on how to make their neighborhoods greener. Those ideas, which can be submitted via the Give a Minute Web site, Facebook, Twitter, or text (specific address TBA) will be funneled to organizers in city government who will connect people with similar ideas to action groups organized around potential solutions. They then may be backed by city resources, which may mean linking them to existing departments that can facilitate a project, to fund-raising efforts, to neighborhood meet-ups, to lobbying groups around the same idea. Ideas can be big — like a strategy for installing more solar panels to small, like a pocket park in a specific neighborhood. Want that pothole down the street to finally be filled? This is not your place. Call 311. In Chicago, the project, which ran from the end of November through mid-December, generated more than 2,000 new ideas. But the mechanism for linking these ideas with actual action groups or agendas was not yet in place. In that sense, the New York project will be “Give a Minute 2.0” — in which the infrastructure for actually addressing problems will be built into the platform. If it works, crowd-sourcing solutions to big, hairy urban problems may become mainstream. And even if it doesn’t quite solve New York’s sustainability issues, it still has the potential to be the best way for the city’s singles to meet each other since the debut of the Matzo Ball.